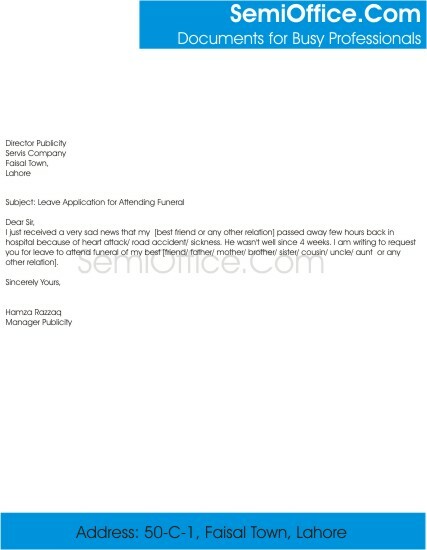 Leave Application for Attending Funeral to boss in office of friend, father, mother, brother, sister, cousin, uncle, aunt, nephew, or any other relation can be mentioned in the application for leave. I just received a very sad news that my [best friend or any other relation] passed away few hours back in hospital because of heart attack/ road accident/ sickness. He wasn’t well since 4 weeks. I am writing to request you for leave to attend funeral of my best [friend/ father/ mother/ brother/ sister/ cousin/ uncle/ aunt or any other relation]. It is to bring into your notice that my paternal uncle passed away in a car accident last night. His last rights will be performed this evening and I have to go to Los Angeles to attend his funeral ceremony. Therefore, I request you to kindly grant me a leave for two days, from 20th to 21st March. I shall join the office on 22nd March. I shall be very thankful to you. I have just came to know that my friend has passed away today because of a road accident. His death is so sudden and i cannot believe this sad news. I have to attend his funeral in the morning. I request you humbly for a leave for tomorrow. I have to go to my friend’s funeral.